Lots of fun at our house this weekend. Friday (which of course, is a day off for both me and Matt) my sweet college buddy Lydia came to visit with almost 2 year old Jacob and 6 week old Lily. Cadence was a fan of both Jacob and Lily. 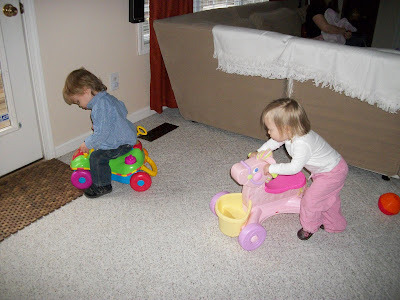 Jacob provided inspiration to play with her wheeled toys - I can't call them cars because one is a horse - and Lily provided an excuse to say "baby" a lot which is one of her favorite words. She was also very interested in Lily's pacifier and toys. Then Saturday we ran errands and did work around the house (we now have a mailbox that meets Homeowners Association standards) until we got to go to a very cool birthday party for some buddies from church. 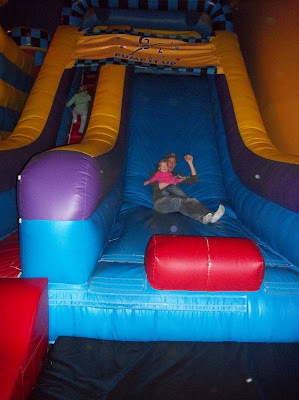 It was at Pump-It-Up - one of those inflatables party places. 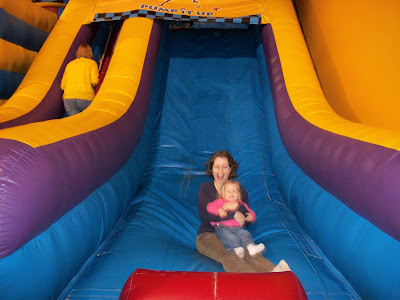 I was a little nervous that Cadie wouldn't really "get" it, which she kind of didn't, but she did have a great time. 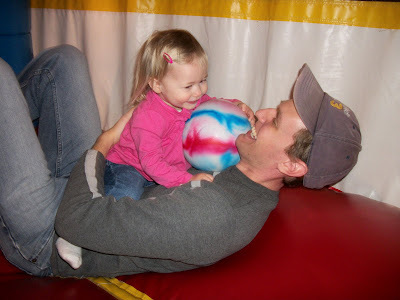 She liked the balls and the bouncy house with Daddy. She had to prompted to go down the slide with us, but then she liked it. Um...we kind of loved it too. How fun and busy your weekend was! Lydia's children are darling. Love the pictures of you all enjoying the inflatable places. What a fun weekend!! I loved the pictures. Looks like all of you had fun at the Birthday party! Glad you and Lydia could get together with the children. We have just recently gone to Pump it up for the first and second times. The boys love it! 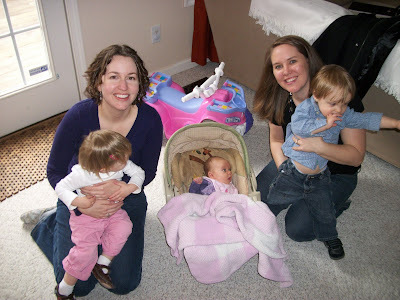 You should try to find a moms group that goes together...we get a rate of $5 per child when we have 15 or more kiddos. :-) Lydia has very cute kiddos...congratulations to her on her second! Looking forward to seeing you sometime in DC.